We’ve beaten farm fresh eggs, and scrambled them with smokey ham, onions, diced red & green peppers and real Cheddar cheese. Then we’ve wrapped all that classic western omelette flavour in a fresh tortilla so you get the perfect wrap – every single time. Grill them, press them panini-style or simply reheat them for the perfect, grab and go breakfast wrap – every single time. 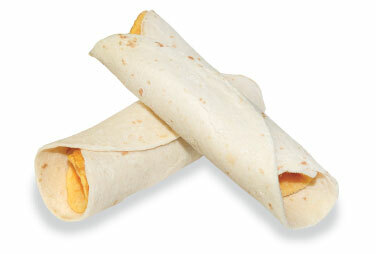 For best results, prepare wraps from a fully- or semi-thawed state. OMELET – Whole Eggs, Pasteurized Process Cheddar Cheese [Cheddar Cheese (Milk, Cheese Culture, Salt, Enzymes), Water, Sodium Phosphate, Milk Ingredients, Sodium Hexametaphosphate, Salt, Paprika and Annatto (colour), Powdered Cellulose (to prevent caking)], Water, Pre-Cooked Ham-Water added (Ham, Water, Salt, Dextrose, Sodium Phosphate, Smoke Flavouring, Sodium Erythorbate, Sodium Nitrite, Green Peppers, Red Peppers, Soybean Oil, Whole Milk Powder, Modified Corn Starch, Salt, Xanthan Gum, Citric Acid. 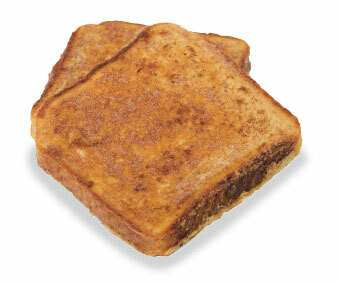 We’ve used farm fresh eggs, whole grain bread and a sweet cinnamon glaze to make delicious, golden French toast. All you need to do is reheat, and voilà! Perfect cinnamon French toast – every single time. For best results, prepare toast from a fully- or semi-thawed state. Whole wheat bread [whole wheat flour, water, bleached enriched flour (wheat flour, malted barley flour, niacin, reduced iron, thiamine mononitrate, riboflavin, folate), yeast, wheat gluten, high fructose corn syrup, soybean oil, salt, calcium proionate (to retard spoilage), dough improver: (malted wheat flour, enzymes, and 2% or less of ascorbic acid)], French toast batter (whole egg, sugar, salt), cinnamon sugar glaze [sugar, vegetable oil (soybean oil, hydrogenated soybean oil with salt, soy lecithin, artificial flavour, artificial colour, and citric acid added as a preservative), vegetable shortening (interesterified soybean oil, hydrogenated soybean oil), ground cinnamon (treated with ethylene oxide), emulsifier (polyglycerol ester, citric acid, ascorbic acid)].